'The Actress' or 'Borne On The Wind'), but still maintaining his own originality and competence to write fantastic cuts like 'All Shades of Blue' or 'Indian Love.' At times however (more often than not! ), this album rocks, and this brings us to the point. 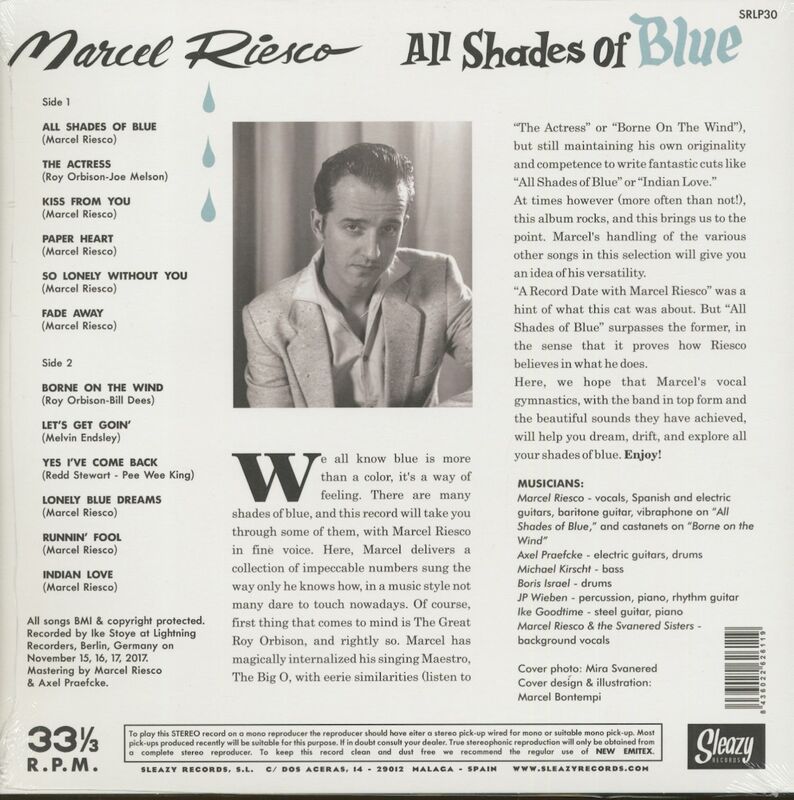 Marcel's handling of the various other songs in this selection will give you an idea of his versatility. 'A Record Date with Marcel Riesco' was a hint of what this cat was about. 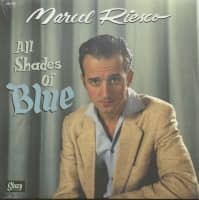 But 'All Shades of Blue' surpasses the former, in the sense that it proves how Riesco believes in what he does. Here, we hope that Marcel's vocal gymnastics, with the band in top form and the beautiful sounds they have achieved, will help you dream, drift, and explore all your shades of blue. Enjoy! Marcel is not new on the scene. Out of Los Angeles, California, he has been performing the rock and roll circuit for years now with acclaimed success and his voice is often compared to the one of a young rockabilly Roy Orbison for years now. Due to this eerie similarity to Roy’s early voice, he has appeared at several Roy Orbison tribute shows. His resume includes performances at the Rock and Roll Hall of Fame Tribute Week to Roy Orbison, sharing the bill with The Crickets (Buddy Holly’s band), Raul Malo (The Mavericks), Glen Campbell, Billy Burnette (Rockabilly legend Johnny Burnette’s nephew) and more; the Arizona State University’s Roy Orbison Celebration in which Roy’s wife Barbara was presented with a Lifetime Achievement Award for Roy; and the 20th Annual Roy Orbison Festival in Wink, Texas, sharing the bill with Roy’s oldest son, Wesley. 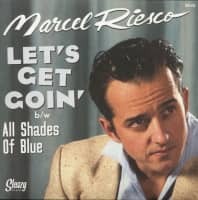 Marcel has also performed “In Dreams – The Roy Orbison Story” in Australia, to sold-out crowds, and thrilled major rock and roll and rockabilly festivals worldwide (see condensed list below), with a nomination for Best Rockabilly Male at the Ameripolitan Music Awards in Austin, Texas for 2017 to boot. He is also a prolific songwriter and rockin’ guitar player with a unique sound. 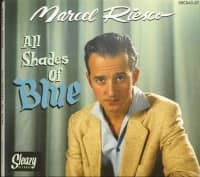 His debut solo LP, “A Record Date With Marcel Riesco,” received an amazing response and the very anticipated follow up album, “All Shades of Blue,” is out now, also released by one of Europe’s leading rockin’ labels, Sleazy Records. “All Shades of Blue” is available through your favorite record dealer or download platform. A fantastic sound and superbly penned original material that together with some hot cover tunes will make this a favorite album and a surefire hit disc. Also, “All Shades of Blue” is presented in full dynamic range for your listening pleasure! If we had to describe the sound: 1950s rock and roll and late 1950s teen pop hit parade, teen beat, rockabilly. “Listen how they laugh and love, cry and try, swing and sway in Teen Town, USA,” and of course, the unmistakable touch of Roy Orbison. There are some amazing shows lined up this year and next, with a great backing band. So don’t miss the chance to see the ever-entertaining Marcel Riesco live, you will be yelling more, more, more! Customer evaluation for "All Shades Of Blue (LP)"